Exactly what the pic showed and exactly what I needed. It did a great job of raising the nightstands to the height of the higher bed level!!! These polished chrome steel furniture legs are a perfect upgrade for any piece of furniture or fixture needing improvement or replacement. Legs are equipped with a leveling screw that will accommodate uneven floors or furniture up to 0.5-inches. 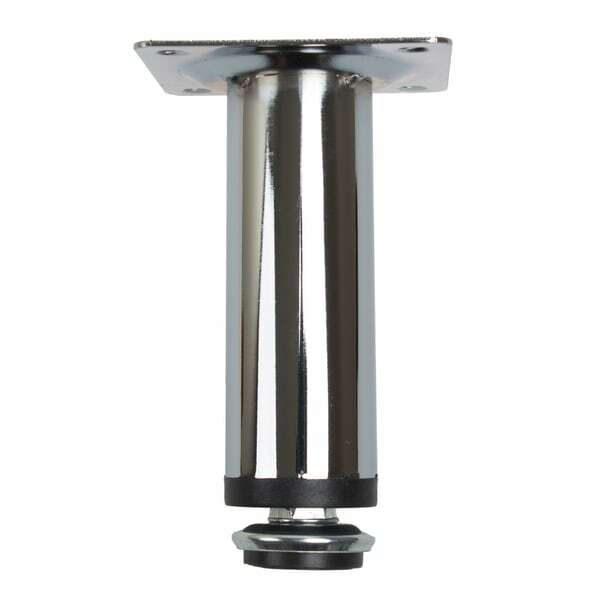 The steel base plate is securely affixed to the leg providing extra durability and is attached to furniture with four screws (not included). Plastic guide-bottom foot to help prevent scuffs and scratches to floors. An inexpensive option to replace worn, scratched or dented legs on your sofa, couch, or other furniture. Great quality. I easily changed out the legs on a leather sofa and these legs instantly made it modern. Love these! These are so cheap and horribly made. If I could give it ZERO stars I would. I really think they are plastic. And the base of the leg is held on by tiny soldered bits of metal. Three of the 4 legs cracked right off the base in less than 2 months. My worst purchase from OS ever. It's not OS fault. Definitely the manufacturer's choice to use cheap everything. We added these legs to the bottom of a 5 ft long cube organizers to raise the height to be used as a tv console table for my son's first apartment. Adding legs to the 17.5 height of the cube organizer (on it's side) made this just the right height for tv viewing. I used these with a finished platform to raise a compact fridge off the carpeted floor. Worked liked a charm, and the adjustable feet handled the slight difference of the edge of the carpet with ease. Very pleased with the great value!